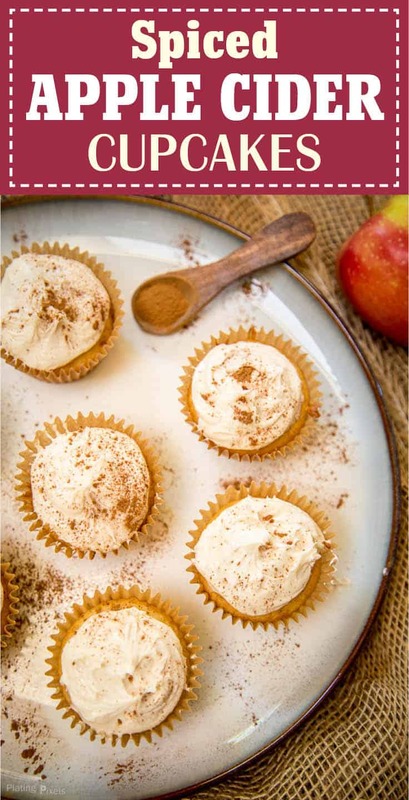 Enjoy the cozy flavor of hot apple cider with these Spiced Apple Cider Cupcakes. Moist white cake batter cupcakes topped with apple cider cream cheese frosting and cinnamon. Side of hot apple cider encouraged. With golden leaves clinging to trees before their eventual transition, fall also brings new seasonal ingredients and flavors. Among those, apples are in peak season. While fresh, and even local, apples are a wonderful treat, you can enjoy seasonal apple flavors anytime thanks to new fall themed products. 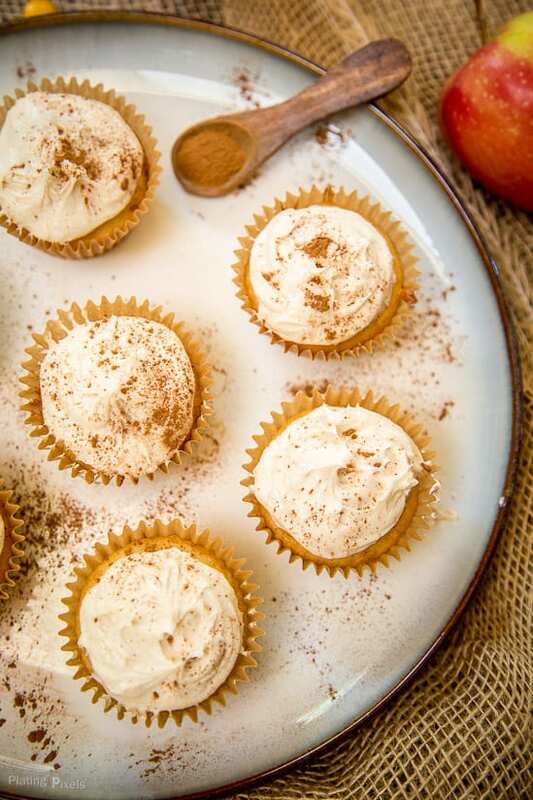 For this Spiced Apple Cider Cupcakes recipe I’ve packed in as much apple flavor as possible, even without using fresh apples. How is this possible you say? I modified classic flavors to make apple cider cupcakes. To start, ground nutmeg is mixed into the cupcake batter to add a subtle, but important spice and flavor. Instead of water, I used apple juice to completely replace it as the liquid. Can you even do that?! Well yes you can. It started as a test to add more flavor and came out wonderfully. Next, mix instant apple cider powder into the frosting. 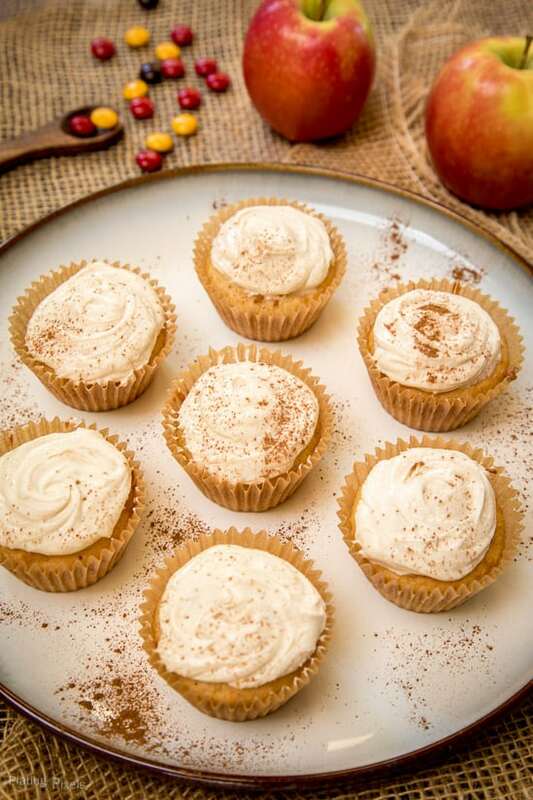 Just a tablespoon in the entire recipe adds a sweet, strong apple cider flavor to the cupcakes. Then sprinkle with a bit of cinnamon for garnish and flavor. Choose the highest quality apple juice possible for best results. Don’t omit the nutmeg or cinnamon as it adds the delicious festive flavor that we all love. A little apple cider powder goes a long way so shouldn’t need more than 1 tablespoon. Remember to let the cupcakes cool completely before frosting or the frosting will melt. Store the cupcakes (unfrosted) in containers for up to 5 days or freeze them. Once frosted they will last for about 2 days. What is apple cider made of? Apple cider in the US is another name for apple juice (although there are subtle differences between the two). It’s sweet, crispy, fresh and delicious and can be enjoyed any time of the day in a nice chilled glass, used for baking or during the festive season served warm with festive spices. In the UK and the rest of Europe, however, apple cider is an alcoholic beverage also known as hard cider in the US. 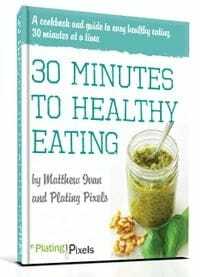 It can spark a little confusion when it comes to recipes so to clarify this recipe is made with unfermented, non-alcoholic apple cider. Moist white cake batter cupcakes topped with apple cider cream cheese frosting and cinnamon. 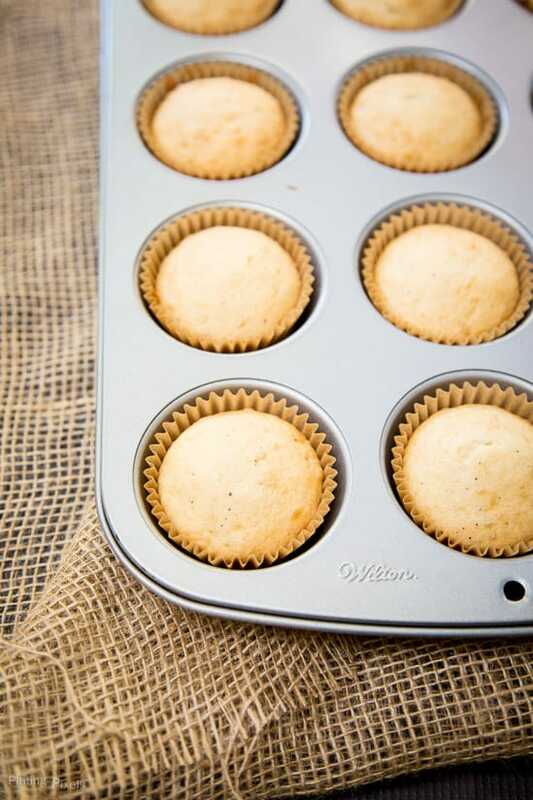 Preheat oven to 350º F. Line a muffin pan with regular size cupcake liners. In a large bowl combine cake mix, apple juice, water, eggs and nutmeg until moistened. Beat with a mixer on medium speed for 2 minutes, until slightly thickened. Pour batter into cupcake liners. Bake 18–20 minutes, until a toothpick inserted in center comes out clean. Cool for a few minutes, then remove from pan. Bake in multiple sets depending on the count of your pan. Stir apple cider powder into frosting mix until well combined. Spread over cooled cupcakes. Don't omit the nutmeg or cinnamon as it adds the delicious festive flavor that we all love. A little apple cider powder goes a long way so shouldn't need more than 1 tablespoon. Thanks Samantha! They totally were! Simple and tasty! Great idea using the apple cider drink powder! It’s not just for warm drinks. Thanks Kimberly! These cupcakes look wonderful and pretty simple to make. Thank you for sharing! They sure are. Thanks Ashleigh! These look ridiculously delicious! Fall is my very favorite season because of things like these. I can’t have fruit or sugar until next month (doctor’s orders, so I gotta be good about it) but these are #1 on my list of things to try when I can. Thank you for sharing! Thanks so much and I’m honored Brittany! It’s good you have something to look forward to after your sugar fast. Hope you enjoy! Thanks Chrisy. Just a few things creates a whole new unique recipe. Guess you’ll have to add to the list. Thanks! Oh man, these look sooo good! Perfect for a fall gathering or party! They definitely are and I’m sure they’ll be a hit. Thanks Julie! I didn’t know till now either Joanna. All the fall flavors look yummy! What an easy way to transform cake mix into a true fall treat! I love the addition of apple cider in the batter, and what a really cool idea to mix powdered apple cider drink mix into the frosting (I didn’t even know such a thing existed!). These really would be such a quick and easy, yet super-fun addition to any fall party or potluck! I used to drink them when I growing up and thought it’d be a fun way to flavored baked goods. Turns out it works great! Thanks Shelley! Delicious cupcakes! Perfect for Halloween or Thanksgiving Party! They sure could be. Thanks Ilona!